As one of the contributors referred to in this post, and as the one who took the photographs in that post, it occurred to me that I should comment further on the reference. And in doing so, perhaps I could add to the small collection of personal statements that have been gathering on this site since mid-2011. I am 100% sure I took the photograph above during that same visit to Greece in 2008. As I snapped this photo my mother was at my side and we both remembered having stood in the same spot in 1969. My mother’s parents had built this school, or an earlier version of it, in the 1930s. Then the Nazi Occupation, followed by the Allied Occupation and Civil War, my mother’s emigration to Chicago, meeting a young Yankee at the University of Chicago, marriage, children, and finally my mother was reunited with her mother in Greece (her father had perished during the Allied Occupation decades earlier) in 1969. Happily, I was with her. So were my two sisters (my brother was another couple years from happening). Among the many good things to happen to me in 1969 was an introduction to Hermes. 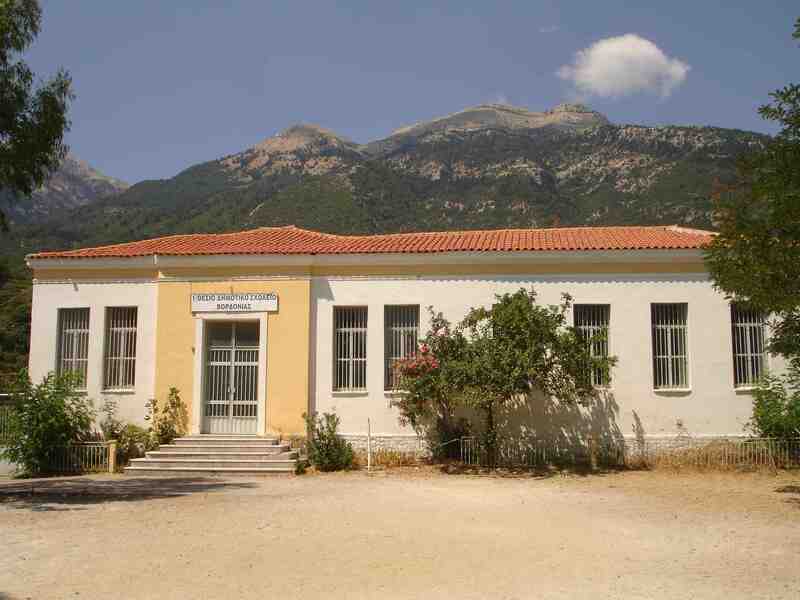 We were in the village of Vourthonia, where my mother grew up. Now she was back with her own children, and I was just old enough that summer to see the reverence of the village people for my mother’s parents. I saw and felt, but did not fully understand until a later visit when villagers explained to me, that my grandparents’ contribution of education to Vourthonia made it possible for the children in many families to grow up to become doctors, scientists, business professionals living in nearby Sparta, further afield in Athens, and much further afield outside Greece. That school had my attention in 1969 mainly because children my age would congregate there each morning to play ball. It was summer, and my own school back in Chicago was on a long recess; same here. When ball games finished, there was exploration in the mountains and plenty of other diversion. But at night, in the same home where my mother had grown up, it was story time; mythology. That was my opportunity to adopt a god as my own guardian, which did not fit very well with what I learned in the modern Sunday School I attended back home, but no matter. It was Hermes. None other seemed as good a fit for me. My mother told the story of her steam ship journey from the port of Piraeus near Athens to New York City’s Ellis Island. Hermes had been with her. I wanted to know what he had done for her on that journey, and I know I asked but I no longer remember what she said. Instead, I remember learning that he had been with us during our family’s long airplane journey to Athens, and the long road journey from Athens to Sparta, and from Sparta to Vourthonia. And that he would be with me on every journey. And then sleep, dreams and on to the schoolyard in the morning. Many years later, I discovered that there was a company that had appropriated Hermes to sell expensive fineries. Luxury, it was called. It did not match my personal connection to Hermes. That is a story for another day. On the day the photo above was taken, I recommitted myself to Hermes, with thanks to my mother for the lesson nearly 40 years earlier, and to my grandparents for the place where I first heard that story.